TUCSON, Ariz. - As the time for Thanksgiving dinner closed in, some people were dispatched on a high stakes mission to try and get everything they need for their family feast. They rushed to food stores to find and fill in those key ingredients that make the meal complete. Modern shoppers have come a long way from the days when the Pilgrims had to head for the woods to hunt down a turkey. But at the Bashas at Swan and Camp Lowell some hunting instincts were still on display. We found Sandra Lueders rushing down an aisle: “I'm looking for some melting wafers, chocolate melting wafers and nobody in town has them, except they do. I don't believe it. I need, like, all of them." When you make an elaborate menu, there's an extra danger you'll forget something. Then someone's headed out for a rescue mission. 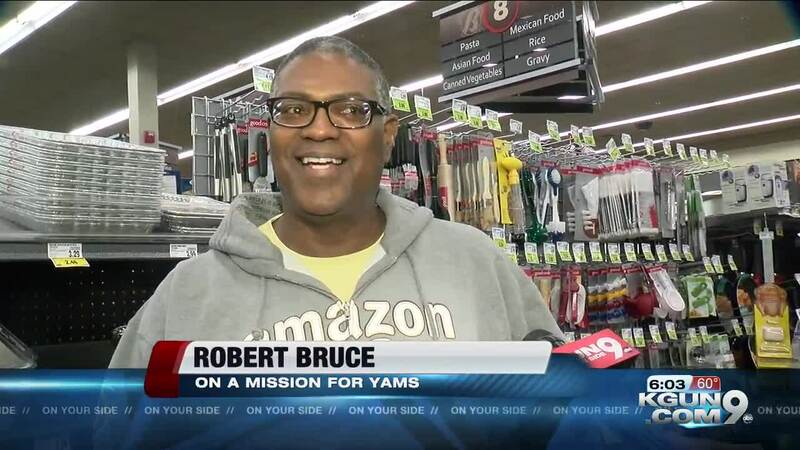 Robert Bruce was searching for a turkey baster, and more: “Like the yams were on the menu and....I forgot them yesterday, right? So it's like, okay I can go out and get yams and get whatever else you need..."
Now let's face it. On Thanksgiving Day, a frozen turkey is a lost cause unless you're planning to delay Thanksgiving dinner until sometime next week. Now for last-minute cooks who still want to cook the bird themselves, you do have the option of a fresh turkey. Or you have the option to opt out entirely, sit back and let the store cook a complete meal you just have to pick up. That’s what John Freyer did, “After years and years of doing all the crazy, everything's got to be from scratch, I'd rather spend time with my family and enjoy myself rather than beat my brains out." But however they tackle Thanksgiving, these shoppers can head home knowing they've done their bit to save that special dinner.